Daimler and telecommunications giant Qualcomm Technologies have announced a partnership to develop new wireless charging technologies for vehicles and phones. 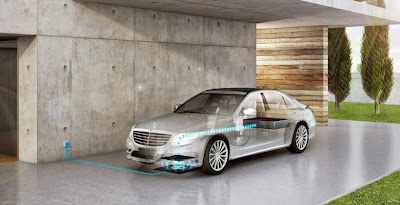 The alliance will focus on “mobile technologies that enhance in-car experiences and vehicle performance,” as well as Qualcomm's Halo Wireless Electric Vehicle (WEVC) technology, with the overall aim of introducing an induction charging system into future Mercedes models. Possible candidates for the technology could include the next-generation Mercedes-Benz S-Class, currently powered by a plug-in hybrid 3.0-litre twin-turbo V6, or even the small-sized B-Class Electric Drive. Qualcomm, more widely known for producing a range of high-end smartphone processors, started developing the technology in 2011 and WEVC trials have been underway in the United Kingdom since 2012, with the technology working similarly to wireless phone charging. A Vehicle Charging Unit (VCU) is installed in the floor of a garage or car park, which sends power wirelessly to a similar unit installed in the car, which sends power to the electric vehicle batteries. Currently the technology only allows for stationary charging, but development is underway on dynamic charging that will work by installing multiple VCUs underneath roads capable of charging cars on the move. The implementation of dynamic charging could cut the cost of electric vehicle manufacturing by reducing the need for large, range-extending batteries. Additionally, Qualcomm's WiPower technology will be implemented to allow full wireless charging on a smaller scale, for compatible smartphones and tablets inside the vehicle. Daimler AG group research and Mercedes development board member Thomas Weber said the new partnership will bear fruit for both companies. “It's important that we remain on the cutting edge of technology and continue to deliver unparalleled experiences to our customers,” he said. Qualcomm Incorporated President Derek Aberle said integration of vehicle and mobile communications is the way of the future. “The automobile has become an extension of always-on connectivity, and as such, we're continuously utilising our expertise in wireless mobility to deliver in-car experiences comparable to the ease and convenience of smartphones,” he said. Last year, German luxury rival brand BMW announced it would team up with Daimler to research and explore the possibilities of similar technology, and Volvo has also previously revealed it is looking at the cordless tech and Toyota signed a deal with WiTricity in late 2013. Californian Electric car specialist Tesla has also tested the potential of such systems, but dismissed them saying too much power was wasted in the transfer process.